The African Egg Eating Snake is a member of the Dasypeltis genus of colubrid snakes. 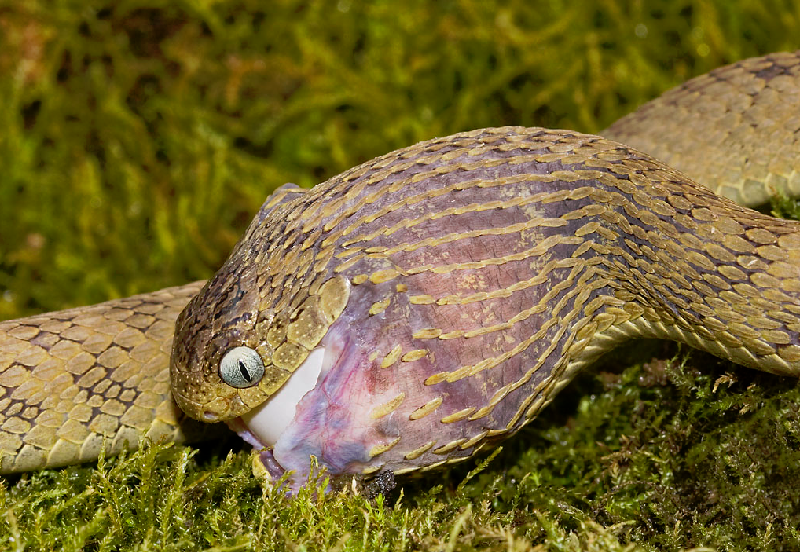 It is one of only two taxonomic groups of snakes known to have adapted to feed exclusively on eggs. They are non-venomous and found throughout the continent of Africa, primarily in forested habitats that are also home to numerous species of birds. The species of this genus exhibit a wide variation in patterning and colour, from mixtures of browns and greens, to solid black. Individuals in a specific locality tend to share similar colour and pattern. They vary in size greatly, from 30-100 cm (12-39 inches) in length. Dasypeltis species tend to have a nervous disposition, and when threatened will perform what is called saw-scaling, where it will rub its scales together quickly to make a rasping noise that sounds vaguely like hissing. They are agile climbers, and have a keen sense of smell to tell whether an egg is rotten or too far developed to be comfortable to eat. They have extremely flexible jaws and necks for eating eggs much larger than their head, and have no teeth, but they do have bony protrusions on the inside edge of their spine which are used to aid in breaking the shells of eggs. The process of consuming an egg involves wrapping their mouth around it and drawing it into the throat and then flexing their muscles pushing the egg into the bony protrusions on their spine, which causes the egg to collapse in on itself. Then the snake carefully squeezes every last bit of liquid out of the inside of the egg, ending with regurgitation of the completely crushed egg shell. They are remarkably efficient, and waste very little of the contents of an egg. Click HERE for a African Egg Eating Snake care sheet.